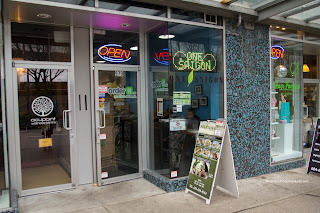 The chances of finding good Vietnamese food in Downtown Vancouver is as good as not finding urine on the washroom floor at a Chinese restaurant. 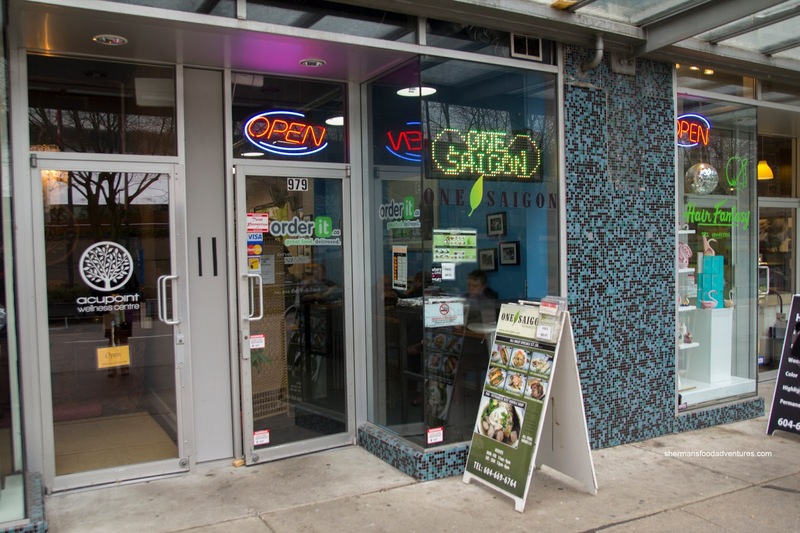 Yes, that is an unappetizing analogy but really, the choices we have for Vietnamese grub in Downtown is downright depressing (especially for a city that boasts some pretty decent Vietnamese joints). So with Whipping Girl anxious to eat something other than a Japadog (because her beloved Mangal Kiss has not reopened as of yet), I thought it would be a good idea to drag her along for some Pho on a cold winter day. Actually, we were planning to head to Shizen-Ya, but there weren't open yet. Enter One Saigon a couple of stores down. We ordered a few things to share starting with the Traditional Banh Mi. Now, I'm not sure what they meant by traditional because the hoisin-based sauce threw us off a bit. Beyond that, the individual components were acceptable especially the crusty bread. We wished there was more pate and possibly a splash of Maggi or fish sauce. 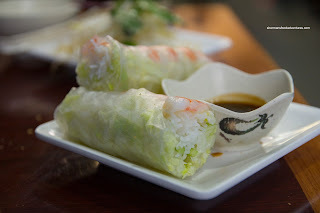 Next up was the Shrimp Salad Roll which was a bit plain without basil. Yet, it was constructed nicely with a properly textured rice wrapper. We weren't big fans of the dip as it was mostly hoisin and very little peanut. 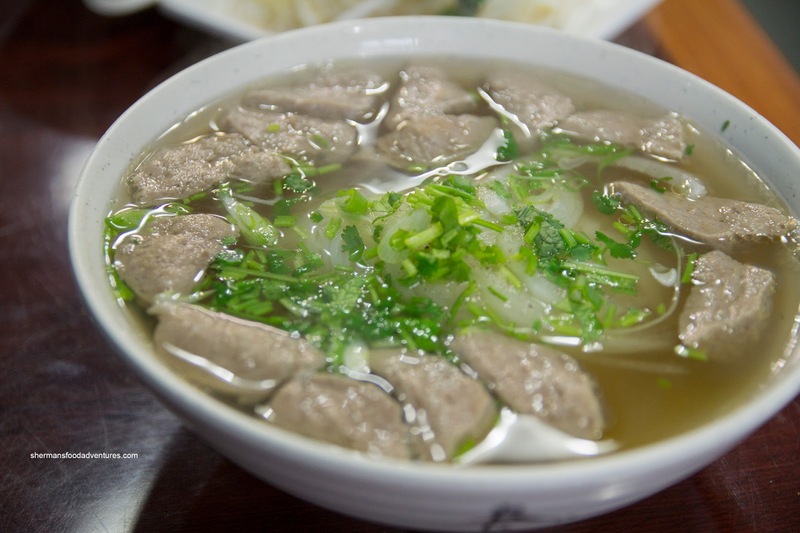 Of course we had to get a bowl of Pho as a baseline of sorts. 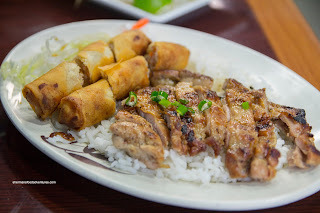 We ended up with the Pho Bo Vien since Whipping Girl loves balls... Uh... Anyways, the broth was rather light and a bit sweet. It lacked depth and meatiness. The noodles were good though and really, for Downtown, this was a decent bowl of Pho. Lastly, we had the Lemongrass Chicken with Spring Rolls on Rice. This was a modest portion which featured a wheat wrapper spring roll. Yes, they didn't use rice wrappers, but I'm sure it was done out of convenience since rice wrappers dry out really quickly (which means they would need to make them to order and by the looks of the kitchen, that would be too much trouble). Looking beyond the wrapper, it was fine. As for the chicken, it was moist with a modest lemongrass hit. Again, a decent offering considering its location. And that pretty much sums up One Saigon. Put it anywhere else and it would be mediocre, but since it is right smack in the middle of Downtown, it does the job at a reasonable price. Sherman, I swear, you need to get your head out of the gutter. It's not very appetizing to read a food blog about food when 'urine' is mentioned in the same paragraph. Also, this problem is more of a guy thing. Women tend to be tidier. Anyways, just saying. I still love your blog. 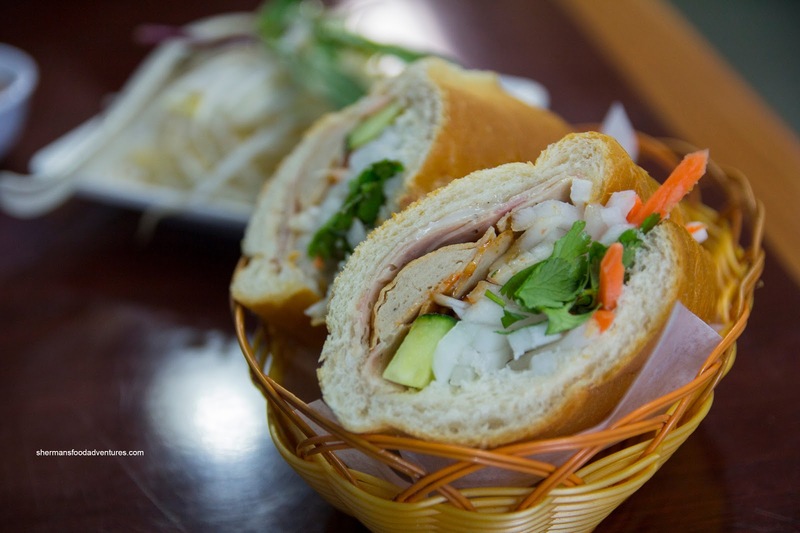 Joyeaux Cafe on Howe offers a better selection if you're looking for Vietnamese cuisine in Downtown Vancouver. Beware, this place is packed during the lunch hour.